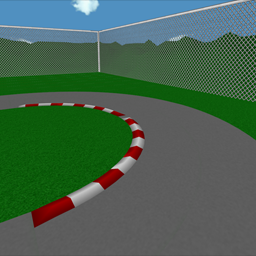 That's one of the 'Grand Prix' versions you can find on Re-Volt's source code. The track is nothing like a masterpiece, but I think it's still an important part of Re-Volt's story, and so I wanted to convert it to the game. The track's mesh file have a name of 'TEST250.MAX', found inside 'RV_MESHES>TEST' folder. Credits for the visible geometry (excluding fences and mounds) goes to Simon Harrison. See the readme.txt for more info.